Israel and Palestine have forever been at war with each other. The war itself has been a popular subject in postmodern art, and a lot of art has been dedicated to starting a dialogue between the two groups who are trying to occupy the strip of land between the Mediterranean and Jordan. The wall that protects the Israelis from Islamic terrorist attacks is dotted with colorful graffiti of dozens of artists on both sides of the border. And yet both sides still don’t want to stop the violence: one side claims that the Jews have no business being there and that the land is for Palestine. The other one cites historical and holy records of the Land of Israel. And so instead of being an instrument of peace, even the art world is pulled into the war between the two factions in various ways. One such way is the government of Israel defunding any art that is critical to the gov’t. Calling it the “Loyalty in Culture” bill, its basically the right-wing Israeli gov’t accusing their critics of racism, sexism, and other alarming things, effectively branding them as traitors. Miri Regev, who is Israel’s culture minister, supports this bill and has been known to use such tactics to gain the favor of her right-wing party. 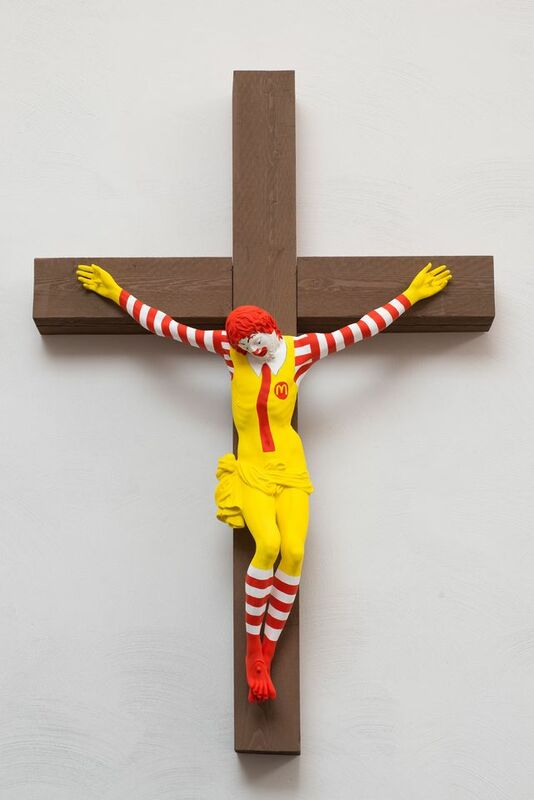 One such work that received the ire of the Israeli government is the McJesus (2015) by the Finnish artist Jani Leinonen. Jani work is basically Ronald McDonald, crucified on the cross instead of Jesus Christ. Leinonen is a known critic of capitalism, and his works usually involve capitalist icons, such as McDonald in this case. The work is currently in the Haifa Museum of Art and the museum is trying to resist the government, who has been threatening to defund the museum. Regev explains that the work is illegitimate “as an act of artistic protest” and went on to say that the gov’t cannot consider it as art. Haaretz, a newspaper, called the minister’s threats “censorship” in their op-ed, and “baseless” by citing the country’s Budget Foundation Law in a report. Facing the prospect of losing funds should, they continued hosting the work and resisting gov’t censorship. But everything took a turn for the worst when Arab Christians protested last Friday. Officers were in the scene to prevent the mob from entering the museum, at least 3 of them were injured when the protest turned violent, with one protester threw a firebomb at the museum. Nonetheless, the museum still refuses to remove the work from the exhibit, and instead posted a trigger warning at the entrance of the exhibit instead of discussing this with the protesters, church leaders who have denounced the work, and gov’t officials.